Raymond Evison Clematis. 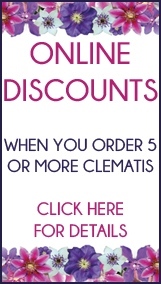 As we are all aware Raymond Evison is the biggest breeder of clematis in the world. Raymond Evison is a good friend of Taylors Clematis and we work very well together, we have helped him launch many, many new varieties of clematis over the years at various flowershows (Chelsea being the main one really) We will continue to help him in every way we can, rising the public awareness of these fantastic cultivars he produces. Site: All aspects, except north facing. Fully hardy UK. Site: Any site with partial shade. Pruning: Reduce all stems down to 6" (15cm) late winter/early Spring. If grown in a hanging basket it can be pruned down to 6" (15cm) in mid summer to rebloom in early autumn. Site: Best out of full sun. Site: Any aspect but in full sun the blue colouring disappears.